Keep harmful bacteria at bay and keep your food fresher for longer with the antibacterial door seal. By helping germs from entering and forming inside your fridge, you can have peace of mind that your food is stored safe and clean appliance. Lock in vital nutrients and flavours for longer using the Quick Cool function which rapidly lowers the fridge temperature –perfect for storing new foods after the weekly shop. Store even bulky items and large bottles hassle free with the adjustable glass shelves and wine rack. 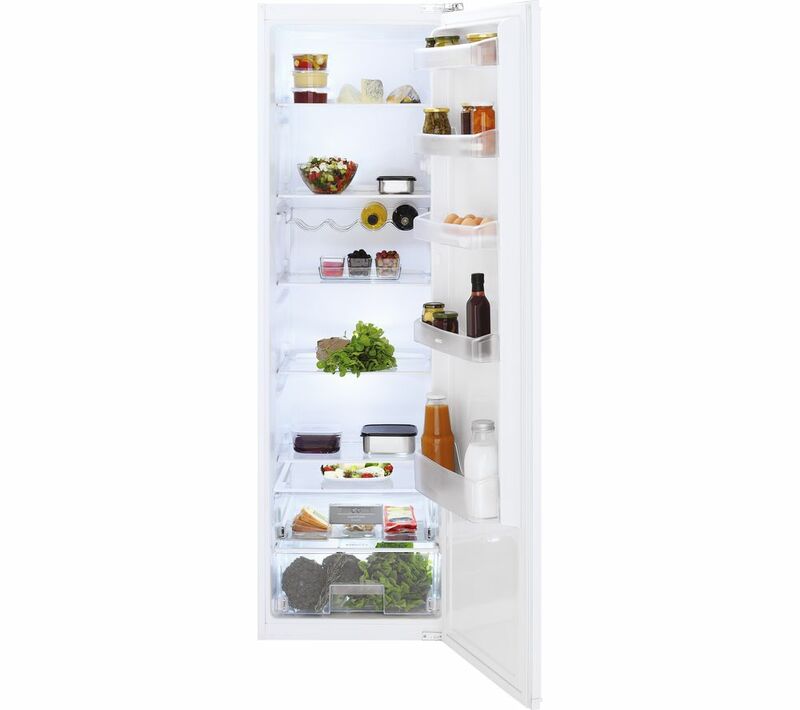 Stock up for the whole family and stay organised with this Beko BL77 integrated tall larder fridge. The handy chiller compartment helps keep meats and drinks cooler than other fridge areas. Place your fridge anywhere in your kitchen as the reversible door allows you to open from both the left and the rights sides – designed to suit your kitchen layout and perfect for kitchens with limited space. Reversible door - hinged on right. Includes installation kit. Contact supplier directly to arrange door reversal – they will determine the cost of this service. Please don’t select door reversal service when adding product to basket. The build quality is good. The two lower drawers are very useful. the wine rack is an excellent use of space. Value for money is excellent. I paid twice as much for a similar Electrolux. It was repaired in first year and was uneconomical to repair after three years, hence this purchase. Wish it was slightly larger inside. Love all the space and good value for money. Easy to install and does what we hoped.